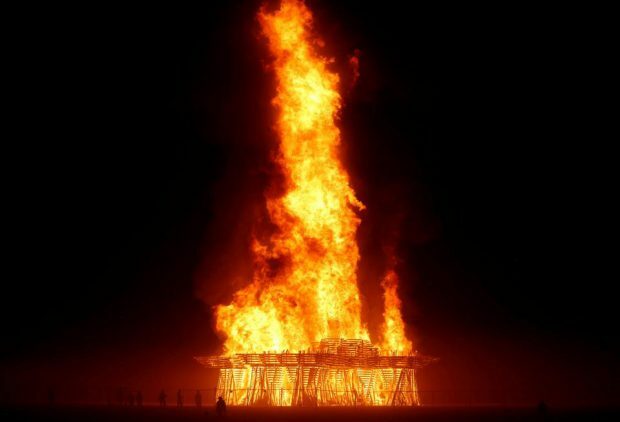 As an estimated 50,000 people celebrated Nevada festival Burning Man‘s signature burning ceremony last Saturday night, a man flung himself into the flames in a horrifying metamorphose of the giant totem from which Burning Man takes its name. CAT DONNELLY explores how the ethereal ideas of a 1986 gathering has been misplaced by our 21st century drug culture. While the fur boots, glitter bras and dust-masks may have been dusted off and stored away for another year, the family and wife of Aaron Joel Mitchell, 41, are still grieving the loss of a man they remembered as happy and healthy. With the toxicology report still pending, the only logical answer to this bizarre tragedy is suicide. 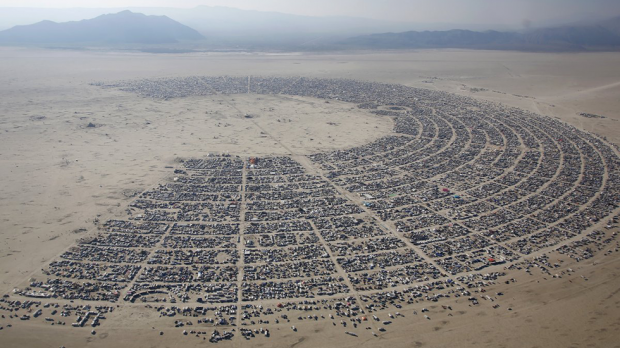 However, questions have arisen on whether the spiritually-augmented ideologies of its founders, which set Burning Man apart from the Coachellas of this world, are unbefitting to mass crowds as the festival has plunged into the mainstream. Love it or hate it, Burning Man has always stood on a more moral chaste to today’s regular music festivals. 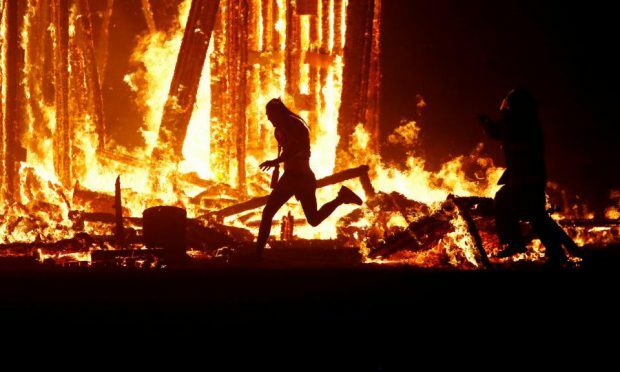 The original idea of founders Larry Harvey and Jerry James was to celebrate the summer solstice with a bonfire ritual in 1986, where a 9 foot wooden man was burned in a symbol of spiritual rebirth, has now grown to be a celebrity studded and instagram-documented event for crowds of 50,000 people in Nevada’s Black Rock Desert. Despite the masses, the organisers still pride themselves on maintaining the true meaning of the festival. Co-Founder Marian Goodell describes Burning Man as a “facilitator of culture”, with no corporate sponsorship and no cell service available. With the stunning desert sunset one of the headline acts, and an epic display of communally made artwork of both sculpture and body, one can easily justify the reference to Burning man as more an ‘experience’ rather than an event. However, the promises of cosmic and spiritually awakening experiences do not exempt Burning Man from the drug use that happens at music festivals worldwide. 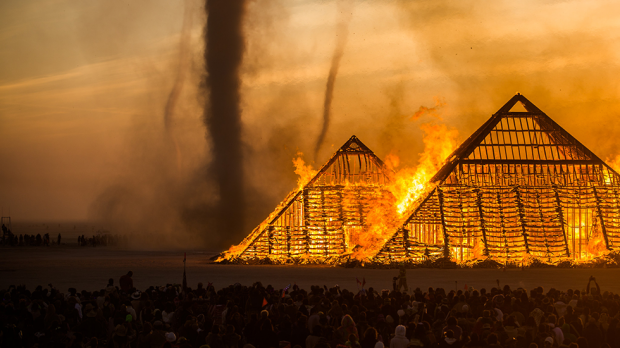 Parallel to the bizarre events witnessed last Saturday night, on paper the drug culture of Burning Man is comparably petty considering the 272 drug-related arrests made at this year’s Tomorrowland. Pershing County Law Enforcement made a mere 40 arrests for both possession and trafficking of controlled substances, mostly psychedelics like LSD. However, these numbers do not coincide with the undeniable popularity of drug-taking at the event, seen by the thousands of drug-trip blogs which pervade the internet annually, including a growing list of answers for search bar questions like, “What should you think about before trying LSD at Burning Man” on discussion website Quora. Evidently, targeting drug use is more of a feat than a duty for the Pershing County law authorities, among the 50,000 people sprawled over a seven mile desert sandstorm. While the festival itself promotes its revered principles of self-reliance, participation, care for one another and the act of gifting, the reality of this in an environment of people with countless narcotics, providing a safe environment for punters has become unrealistic for Burning Man organisers. It is not to say the tragic actions that led to Mr Mitchell taking his own life were within the hands of the festival and not himself, but County Sheriff Jack Allen said it was not the first time attendees have attempted to break down security in pursuit of the flames. It’s a problem organisers have worked to contain, and Mr Allen stated his rangers do the best they can with a human chain to prevent fatalities like Mr Mitchell’s. Perhaps these ideas worked for Harvey and his circle of 250 friends on a San Francisco beach in the late 1980’s, but the tragic actions of Aaron Joel Mitchell against the backdrop of intoxicated strangers deem such ideas of connection and community sadly obsolete.